"The Winner of the 2009 Right Fit Award" Dr. Arlene’s guest is 38-year-old Nat Bothwell, a bank employee for 12 years after receiving his MBA, who was given two hours notice before losing his job on May 9th 2008 as the corporate Executive Vice President of Marketing of ANB Bancshares in Bentonville, Arkansas, one of the first banks in the country to close its doors, which included 12 locations. At its peak, the Bank had 2+ billion in assets. In our current economic situation both employees and entrepreneurs should be ready to implement the Right Fit Method in case the ax should fall. New grads entering the workplace with few or no accomplishments need a new way to find a job. Barro global search, inc. of which Dr. Arlene is the founder and CEO, conducted a nationwide contest to find Nat. He is the winner of the 2009 Right Fit Award because his job search strategies, including blasting his resume from Burbank to Bombay, have failed. He represents the millions of unemployed who are using the same ineffective strategies. Long term unemployment is the result. It’s time to stop taking the Shotgun Road with no destination and switch to the Right Fit Road and hear “You’re Hired.” Nat’s contest entry which Dr. Arlene will share indicates that he is ready to embrace and implement new strategies. 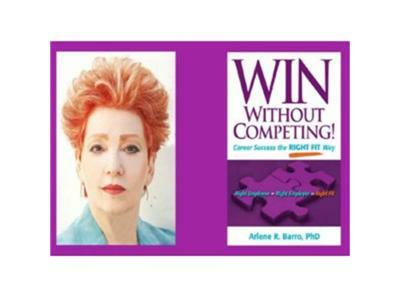 Nat attested that he has not read Dr. Arlene’s book WIN Without Competing! Career Success the Right Fit Way nor listened to her talk show. As he says, “I am as cold as it gets.” Dr. Arlene will coach Nat on how to implement her Right Fit Method and walk with him down the Right Fit Road. It is up to Nat to change his behavior and get himself ready to hear “You’re Hired.” Dr. Arlene and her listeners will follow and encourage Nat on his journey until he succeeds. Then barro global search, inc. will name Nat the WIN Without Competing! Man and present him with an engraved gift with his new title.